Two of our Northwestern Engineering alumni got to shake hands and talk with President Obama Tuesday during the first-ever White House Demo Day. Demo Day focused not only on innovation, but it also shed light on diversity in the entrepreneurship space, hosting more than 30 startups founded by women and underrepresented minorities. Alumni Hannah Chung and Aaron Horowitz showed off Jerry the Bear, a smart stuffed animal that teaches children healthy behaviors. Chung and Horowitz first created Jerry the Bear during their time in Design for America, an award-winning nationwide network of interdisciplinary student teams and community members using design to create local and social impact. Chung helped found DFA, starting the first studio in 2009 here at Northwestern. Since then, the student group has spread to 29 studios throughout the country. Chung and Horowitz are both currently DFA national board advisors. 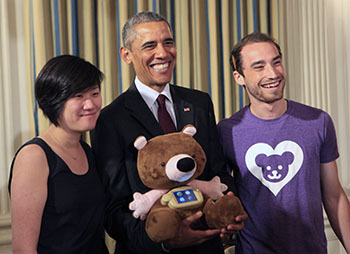 After graduating in 2012, Chung and Horowitz started Sproutel, where Jerry the Bear became their flagship product. Created originally for helping children with type 1 diabetes, Jerry the Bear will soon have expansion packs of animated storybooks and accessories for asthma and food allergies education. The expansion packs will be released in September and can be preordered online.